We went into the game against SKOBS with high expectations we could challenge them. The conditions were windy with a three-four goal breeze favouring one end. We kicked against it in the first quarter and did a reasonable job, keeping SKOBS to 2.7 whilst managing to kick a goal into it. For the remainder of the game though we really were soundly beaten in all aspects. 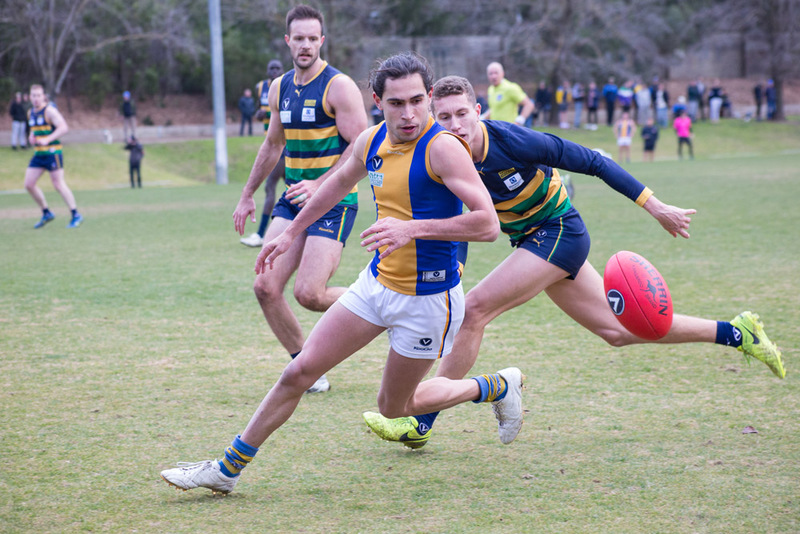 For SKOBS, Mitch Brown proved too good in the midfield and kicked three goals whilst their wingman Thomas Jok really hurt us with his run and speed. We had too many players not perform anywhere near their best and the opposition were much cleaner by hand and foot. The usual suspects Sam Williams, Tom Humphrey and Jake Gotch did their best to stem the tide, however we just did not challenge them with our run & carry. The side really missed the drive of Jason Tutt and Jake Williams also returns this week after a month away. We’re away to Uni Blacks this week in what is another vitally important game to our top four chances. The reserves game started earlier than normal this week, kicking off at 10.00am. We kicked with the breeze in the first quarter and had the ball deep in our forward line for the first five minutes for only three behinds. Then SKOBS charged forward, going on to kick 6.1. to our 3 behinds. We started the game with 21 players but as it happens we lost three to shoulder injuries before half time. Brett Cranage and Sam Harrington headed off to hospital to get scans done and sadly it looks like both are gone for the season. At half time we were down 12.6.78 to 1.3.9 but our boys kept hanging in there and fighting it out. With no bench after half time we won the third quarter, three goals to two. Ed Clinch kicked three and was our best for the day, Liam Bisognin worked hard as always and Ryan McDonough toughed it out all day against big Jamar. Tyson Parker, Paddy Burnell and the rest of the back six fought hard all day. We keep on turning up as we have to and have another chance next week to get some confidence back into the group. Uni Blacks await us and we look forward to putting on a competitive show. We all wish a speedy Recovery to Brett and Sam. On what was a big day for the club, Caulfield posed a serious threat and knowing we were coming off a bad loss, they were looking to take a top four scalp. In what can only be described as horrific conditions (thanks to a hurricane wind favouring the scoreboard end), the game never really lived up to any great expectations. The first half was extremely scrappy from both teams. Our skill execution let us down badly. We were working really hard and bringing the ‘heat’ but we just continually turned the ball over at costly times. The second half was very similar. Both teams failed to adapt to the wind and it was a scrappy contest all afternoon. O’Sullivan had his best game for the year, his work rate as a forward across the whole ground was excellent. O’Callaghan was in everything in the middle and our backs were again holding down the opposition. We felt like we were in control the whole game. In the end it got quite close on the scoreboard and we were able to get up by a kick. Best players were O’Sullivan, O’Callaghan, Deftereos and O’Connor. There’s plenty of room for improvement, especially in the skills department. We look forward to the challenge of Parkdale this week. They had our measure earlier in the year, so we feel like we owe them one. After a really strong win last week we faced up to the last placed SKOB (3), who have been facing an uphill battle all year. We looked to take full advantage of that as we make a push to finals. In these game sometimes there can be a tendency to be dragged down to the level of poor opposition, however in this case the players had their opponents on the back foot from the opening bounce and didn’t really let up, a really good sign. As a bizarre means of looking to minimise the damage our opponents had dropped a few players back from their other team, but that tactic backfired as it had the reverse affect and actually served as a spur to the Golds players. Such was the nature of our complete performance that on a day marred by a bitterly cold strong and swirly wind we were able to kick a very impressive 24.6 and restrict our opponents to a miserly three goals. Again it was hard to single out players but the attitude of those who have come back into the side from the Blues has been exemplary and they certainly led the way and helped steer the ship towards this big win. Better players on the day were Pat ‘Sauce’ Hounihan, Remy Cadman, Nick ‘neon’ Leontaritis, Big Mike Canny and Chris ‘Swoop’ Northey, but to use that often maligned term “team effort” that’s exactly what it was. Given the vagaries of the draw, the Golds now have the week off which is probably not ideal but does allow us to keep players fresh and assist the Colts and Blues as we look to have all under 19 teams playing finals footy. by John McDonough – Happiest Coach in the VAFA. With a stiff breeze blowing straight down the ground, winning the toss was our first win for the day. The ball was in our 50 for 90% of the first quarter and we scored 4.6 to nil. Our quick delivery into a hungry forward line paid off and it was great to see the girls rewarded for their hard tackling. The second quarter was always going to be tough against the breeze and we could have switched the ball into space a bit more. We played stoppage footy to slow things down, as one kick with the wind equalled two kicks the other way. Neither team troubled the score board in the second. In the third, we had another good quarter, kicking 2.2 to nil with St Mary’s putting two players behind the footy, stopping our run. A big feature of the last half was our marking. Its great to see a strong overhead mark and Taylor Weltner took a couple of beauties. Sally Fyfield dominated the clearances and was supported well by Mary Luong and Abbey Snell. Brooke Robertson was again strong off half back and it was great to see Ellie Beatty back in defence playing like she had never left. The last quarter as uneventful as we failed to score and St Mary’s registered a late goal. After the game the talk in the rooms was the opportunity to keep the momentum going into our last round next week against Bulleen. Best players were Sally Fyfield, Taylor Weltner, Tina Chokbengboun, Abbey Snell and Brooke Robertson. Post-match the change rooms were emptied in record time as everyone raced off to be ready for the Blue & Gold ball where a great night was had by all! In what was a huge game for both the Colts and Oakleigh FC, we ventured to Jordan Reserve confronted by a strong blustery wind. The conditions meant there would be lots of ground balls, which we dealt with well. Riley Watson was dominating the ruck, getting ball down to our inside mids Adam Martuccio and Josh Ingram but kicking into the wind in the first we were burned by Oakleigh’s outside run which put our defence under immense pressure. We got back on track in the second quarter with the wind but in what’s becoming too common gave up two soft goals in the last three minutes of the quarter to go into the main break seven points down. We knew how Oakleigh were going to play with wind in the third, but we didn’t cope with their run and disappointingly gave up a number of scores directly from their kick-ins. As with last week, we were presented with a huge challenge being 30 points down at the last change. Again, like last week, it took until the last 15 minutes before we threw caution to the wind, played some brave footy to get within four points, but unlike last week the siren beat our comeback. Full credit to the boys for their perseverance and fighting spirit against the odds right to the end, but we need to address the reasons why we are getting ourselves into these positions. Better players were Adam Martuccio, Lachlan Armstrong, Riley Watson, Josh Ingram, Ben Melissinos and Charlie Bird. In the midst of winter with numbers depleted by injury, travel and other things people prefer to do when the temperature drops, we faced a Fitzroy side coming off a 200 point win and who had defeated us the last time we met. The match was moved to the wide open spaces of Waverley Oval to cater for our running game, along with an earlier kick off at 9:20am to accommodate a past players wedding that would have decimated the team. The week leading in was race against time but five people responded to the call to arms to fill in and we fielded a strong line up. We kicked with the breeze in the first term and while we missed some chances, got out to a four goal lead through hard work and smart football. Tom Kovarik copped a knee square to the forehead and while it was overlooked by the umpire, the golf ball sized lump that showed up soon after could not be missed. In the second we ran the ball well into the wind and while Fitzroy hit the score board, we grew our lead and went into half time in control. The third term was spent in our forward half and while we continued to edge further in front, inaccurate kicking left Fitzroy with a slight sniff. With almost no bench and a host of injured players on the field, we put in one of our best quarters for the season and into the solid wind held the Roys while putting on four goals of our own to run out convincing 10 goal winners. Mark Breda was best on ground with a commanding performance up forward (and was awarded the Robert Breda Medal after the match by his Grandmother), while Tim Kovess, Josh Oakley, Dan Pendergast, Joel Stewart, Luke Bertucci, Tom Kovarik and Joe Mannix were De La’s best. We take on Ajax this weekend on Sunday back at Waverley Oval at 11:00am prior to the Warriors Lunch in the rooms. All are welcome and it will be a great Sunday for the club with the Dino’s playing after us. The De La Salle Dino’s continued on their merry way with an easy victory at home on July 16. The game was never in doubt as the Dino’s lead from the outset. With the game well in hand, it gave us the opportunity to play some players in different spots as we try and find our best line-up for finals. Certainty there were no bad players on the day. Mercuri, Chapps & Pauley were all standouts, however, it was great to see players like Dave Harro and Tony the Fishmonger get amongst the action. A special mention should be made of Simon Miller (aka “The Roo-Shooter”) who played his 50th game on the weekend. Roo is just a young man having turned 50, but he plays like a man in his 20’s. Roo is a terrific player who always puts the team first with his play. He is someone who always has a smile on his face and is happy to share a laugh. The Dino’s congratulate you Roo on your achievement, we are a better team for everything you contribute!! Our next game is Sunday 30 July 2017 against St Kevin’s at De La. Its 1st v 3rd and should be a cracking game. We invite all De La supporters to attend – entry is free and so is the entertainment.